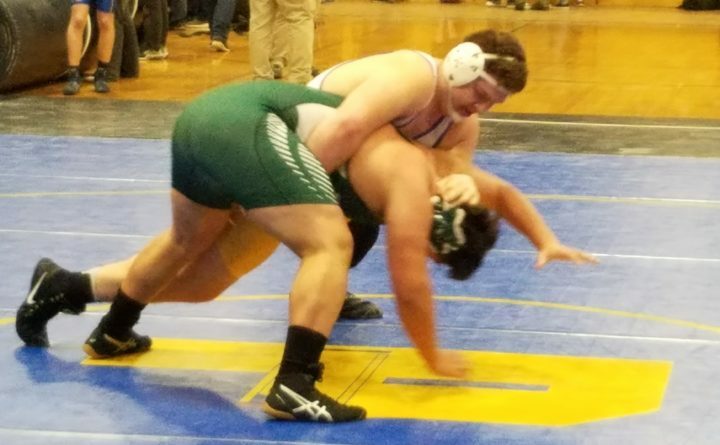 Bucksport's David Gross (top) battles Joseph Tuulima of Penobscot Valley in the 285-pound championship final at the Penobscot Valley Conference championship meet at Piscataquis Community High School in Guilford on Feb. 2. Gross won a 10-2 major decision. The two met again in the Class B North final in Ellsworth on Saturday with Gross winning by major decision, 14-3.